Made of ultra-durable Belting Leather this brief expands 1.5 inches for additional packing space. The convertible back pocket slips easily over any mobile traveler handle. Some features includes a large gusseted front zip pocket with interior organization panel, key clip and rear zip pocket or slash pocket. Front compartment has large mesh zip pocket and removable computer protection system large enough to accommodate most 17" laptops. The middle section can house files and folders. And there's a removable, adjustable ergonomic shoulder strap with a non-slip pad. Shown in Natural Tan. Comes in Natural Tan, Black or Cognac Belting Leather. On the Outside, this piece is made of beautiful natural belting leather that holds up under rough conditions and patinas into a darker handsome look. All with matte black nickel finished hardware. An outside back pocket doubles as a convenient way to slide this brief down the handle of any wheeled luggage piece. All these features found through out Hartmann's collection. 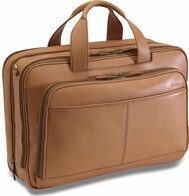 All Hartmann Luggage pricing includes Free domestic shipping and more. Also, no sales tax if shipped to anywhere outside the state of Michigan. On line ordering is of the highest level secure format. We have been in business for over 50 years and offer 30 day Money Back Guarantee. All Hartmann pieces are backed by Manufacturer's Lifetime Warranty. We also can gold hot stamp your initials at no extra charge, just specify desired initials under "Special Instructions" when placing order.